You may be surprised to know that I am not a huge fan of frosting. Whenever I get a slice of cake, I will typically avoid the frosting completely, or only eat a bit of it. It's probably why I prefer naked cakes over any other kind of cake. That and they are so much easier to frost! There is one exception to the rule, however, and that is cream cheese frosting. I love cream cheese frosting! It's most likely because it's not super butter or overly sweets. It's just the right amount of creaminess, tartness, and sweetness. I made this particular batch of cream cheese frosting to go along with some red velvet cupcakes, which I will share with you soon! But since I use my favorite cream cheese frosting recipe in a couple other recipes I will be sharing soon, I thought I would kick things off with this one! If you have never made cream cheese frosting before, it is super simple. All I do is beat together the cream cheese, butter, sugar, and vanilla until light and fluffy. That's it! Unlike Swiss- or Italian-meringue buttercream, there is no labor intensive step of whipping up a finicky meringue or boiling sugar. Just dump it all into a bowl and mix! Because I was just making cupcakes, I halved my normal recipe to have just enough frosting for 12 cupcakes (and a little extra for tasting). If I were making a 2 layer cake, I would make a full recipe. And for a 3-4 layer cake, I would have done one and 1/2 to two times the full recipe. Fortunately, this is a very easy recipe to halve or double! 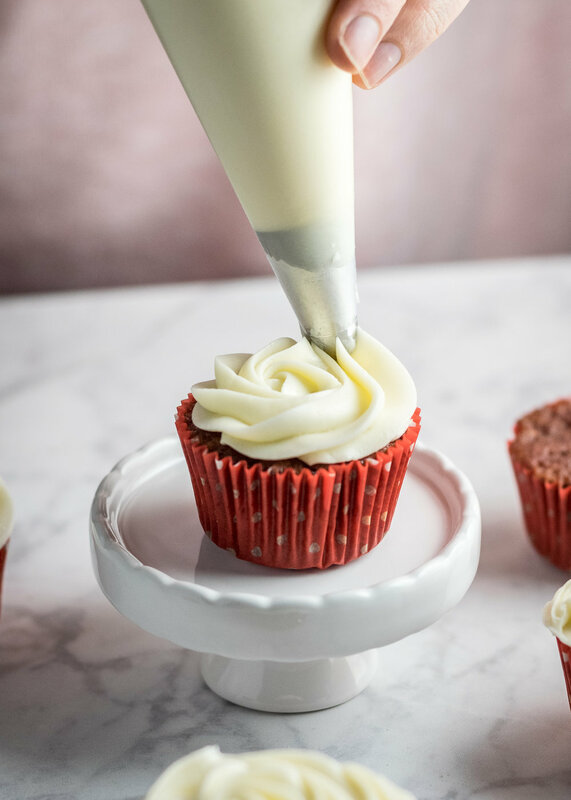 This frosting is not only perfect for red velvet cupcakes, it would also be great on your classic chocolate cupcake for an unexpected twist. It's also great on carrot cake, hummingbird cake, strawberry cake...really just about anything! Or if you are like me, you can just eat it straight out of the bowl. No cake needed! In a large bowl, beat together the cream cheese, butter, sugar, and vanilla until light and airy. About 1 minute. Pipe or spread onto your favorite cake or cupcake. If only making 12 cupcakes, halve the recipe.